As of 19th February 2018, the iconic Sharjah Cricket Stadium had witnessed a record 236 one-day international matches. The first ODI between Pakistan and Australia to be played at the venue on 22nd March 2019 will witness another high-profile game here, extending the world record of most ODIs played at a single venue to 237. Since 1986, 87 cricketers have hit ODI centuries at the iconic stadium in Sharjah. Mohammad Shahzad has the honor of hitting a T20I century at the stadium too. The first ever Test match at Sharjah Cricket Stadium was hosted in 2002 between West Indies and Pakistan. As of 11th February 2018, 105 players have scored centuries across three formats in the men’s cricket at the venue, out of which 17 were in Test cricket, 87 in ODI cricket and one in T20I cricket. There was two women’s ODI centuries too at this ground. 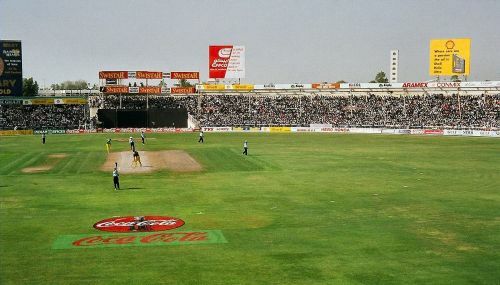 Many great matches have taken place at the Sharjah Cricket Ground. Sachin Tendulkar had a particular liking for the venue, smashing the Australian bowlers to all parts of the ground during his famous 'desert storm' innings. Many other top players have also been a part of iconic matches at this famous ground. Pakistan and Australia will play the first two matches of the five-match ODI series starting from 22nd March in Sharjah, after which the teams will move to Abu Dhabi. The venue that is next in the list of hosing the most ODI matches is the Sydney Cricket Ground in Australia. SCG has hosted 156 ODI matches, with its first match taking place in 1979 and the last in 2019. The iconic Melbourne Cricket Ground is third in the list of most ODI matches hosted by a single ground, at 149 matches. That is followed by Harare Sports Club in Harare, Zimbabwe, which has hosted 148 ODIs.